Mike learned to play the bones somewhere in the 1970's. 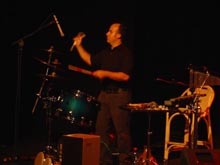 He is a solo performer, he uses them to accompany vocals and to add percussion to his instrumental recordings. He has been called one of the most versatile entertainers in the Midwest. He not only plays bones, but also jaw harp, mountain dulcimer, jaw harp, nose flute, didj., banjo, guitar and a collection of instruments made from junk. He has a bunch of recordings ranging from mountain dulcimer to children's music, to storytelling. Check out his site at http://www.dulcimerguy.com. 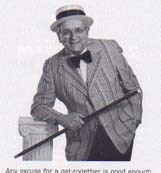 My name is Bob Band and my father, who was 1927 Bones Champion, in Atlantic City, NJ, taught me to play. 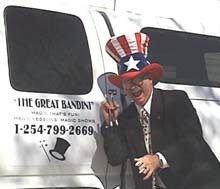 I am now using them in my magic act as "The Great Bandini." Kids love them as they do not see them everywhere. I have a set of ebony bones that were my father's, made in Hollywood, California at some time in his life, and a set of cherry wood that are painted to look like magic wands from 1958. I play those in my show. I have made several sets out of animal ribs and taught others to play in the past. My long time musical interest has been in the traditional music of the 17th-19th centuries, with emphasis on the development of American music from 1830-1865. Bones playing grew out of necessity and soon became a labor of love. As a Civil War reenactor, I'm one of the founding members of the Second South Carolina String Band (1988) and have had the good fortune to sit in with other groups, including the Virginia (Ethiopian) Serenaders and Homefront, to mention a few. We have a number of recording available, including our recently released CD, "Strike the Tent", and have done work for motion pictures, PBS specials, including Ken Burns documentaries, and numerous regional preservation pieces. Our Band contact is civilwarband.com. We realized that Period-style percussion was needed to compliment our sound, so bones, tambourine, jawbone (and triangle) became my instruments of choice. I lovingly refer to this as playing "dead animal parts". Self-taught, with the help of the early "How to Play the Bones" tape and booklet by Percy Danforth (sound familiar??? ), I've had the privilege of spreading the word about playing the bones for the past 25 years, often times providing instruction to others while we break between sets at our performances. I do purchase bones and have also been blessed, over the years, by having a number of my "bone-ified" friends send me packages of ribs and jawbones for my use. Preserving history has been both a career, as well as an avocation, and I hope that we can, together, pass this playing tradition on to future generations! I have been playing guitar and performing folk music of many types and genres as a singer, musical storyteller, song chaser, lie swapper and strange and unusual rhythm instrument player for #%&$*@$!? years. In 1983, I discovered bones at the Walnut Valley Festival when a friend loaned me a pair of Birl's and I was hooked. Returning home to Salt Lake, I got a "lesson" from a local musician to my great frustration. But he told me to not to worry, that I would wake up in the middle of the night and "get it" and to immediately get up "do it." I did, and did it. When I moved to Florida, I ordered 2- pair of Barque's sent to my new home. Since then, I always keep bone and wood bones in the "toy box" in my guitar case along with spoons, shakers, kazoos, train whistles, etc. and pull them out whenever rhythms abound around, and there are just so many guitars that they don't need to add mine. I play mostly one-handed but am learning 2 handed thanks to a recent lesson and encouragement from Bernie Worrell and Jerry Mescher. I also make and sell bones from a variety of local and exotic tone woods which I designed with a flatter 'curve' because I can get more variety of tones and ease of play. I inherited a love for music/shared song via my parents' Scouting activities. I gradually realized how handy Bones are in a rhythmic music - particularly our colonial era dancing that was becoming a feature of the Bush Music Club, the group that started the performing revival of Australian Folk Music around 1954. I play along with "Bush Bands", Australian music from our British / European / Celtic heritage. Bones are most at home in the dancing but I use them for effect behind some singing and play them with Mouthorgan at times. I play one-handed, the way I was taught but I have seen some wonderful old players ... up to 4 sets in two hands. I should work on the left hand as therapy for a broken wrist a number of years back that still brings recurring twinges! "My first exposure to bones playing came about 25 years ago from an old black man named J. C Burris, who played bones and harmonica at the same time. 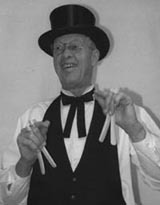 He was from Durham N.C. and had played with medicine shows in the south. I thought it was the greatest thing I had ever heard, and immediately set out to learn and have been playing since. 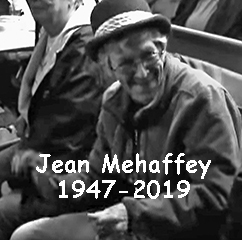 My wife and I perform in retirement homes and senior centers here in the San Francisco Bay Area, and also at local folk festivals." I got into bones playing after watching Canadian bones and feet man, Teilhard Frost, play bones and assorted kitchen percussion with the band Flapjack. I practiced up and now play feet and bones along with other percussion, banjo and mandolin for the band Contranella. I play one set of cow ribs that I bought from a nameless music store somewhere in Ireland and one set of wooden bones made by Steve Brown. You can hear my bonesplaying on Contranella's new album, available at bellersonline.com. Bracha Ben-Avraham, Guitar, Bouzouki, bodhran & bones "Irish Cream" Traditional Irish Band, Web Page here. Greetings, I read your web page with interest and was directed to it through a fellow member of a mailing list for Irish traditional music. I learned to play the bones from Cathy Jordan, singer and percussionist of the Irish traditional band "Dervish". I have three sets of bones, two of which are natural and one of ebony, and I play Irish traditional jigs and reels with a band here in Israel. I am a professional doubler in new york city - I currently play in a broadway show entitled jolson and co., in which I play violin, guitar, banjo, ukulele, mandolin, bones, and spoons. I also play in grachan moncur's band (jazz), and various other improvisatory bands. I got interested in the bones after viewing the lark in the morning web site, and being a "weird" instrument collector (and wannabe percussionist, I soon added the bones to my repertoire, and am now hooked! They are bone bones, and I've been applying them to the jazz, latin, and funk rhythms I frequently play in. My favorite application for them is in a calve rhythm - one hand plays a soft 4-on-the-floor, while your other hand plays a louder clave, rumba, or tango pattern. mostly I use the spoons in funk contexts, because you can get a nice backbeat snap with wooden spoons. 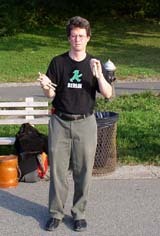 I was first shown how to play the bones in 1997 by an Irish theater director for whom I was providing music. After a 10-minute 'lesson,' I threw down the little wooden buggers in frustration and forgot the whole thing. In 2003, I wandered into a music store in Maryland which happened to have a pair of amazing Black Bart rib bones AND an instructional cassette/booklet by Percy "Mr. Bones" Danforth. On a 4-hour drive home up the NJ Turnpike, I learned most of the basics of bones playing, thanks to Percy's excellent cassette 'course.' I'm a working drummer, percussionist and Taketina rhythm teacher. I play bones in many musical situations here in New York City—for example, in a solo percussion/voice concert I gave in Estonia in Sept., 2005, now available as a CD on the Satchimay Interventions label for $5/copy including s/h. If interested in ordering, please email me at: greg_b@mac.com. I prefer 'bone bones' but play also the various wood bones (purple heart, pine, verawood, others). Bring on the BONES! Hi-- I'd like to introduce myself. I'm Paul Busman, and am a Podiatrist by day, and wooden whistlemaker by night. Check out www.busmanwhistles.com. I dabble with the bones a bit, and would like to get good enough to play them at sessions once in a while as a break from playing whistle and flute. I got into bone playing when Bone Quint aka Jeff Lefferts asked me if I could make him a whistle out of one of his favorite bone woods, Macacauba. I did it (beautiful wood, btw) and took a pair of Macacauba bones in partial trade. I also made myself a pair (not as nice as Jeff's) out of some awesome "salvage" Birdseye Maple that was too thin for a whistle. This salvage wood is interesting... it's old logs harvested about 100 yrs ago. They floated them to the sawmill and for some reason many of them sank in the Great Lakes and sat in the deep water for all that time. They were deep enough that there was no oxygen to allow the wood to rot. In recent years they've been bringing these old growth forest logs up and milling them into really beautiful timber, which is denser than wood growing in sparser forests today. Expensive, but great stuff. Check out www.timelesstimber.com. I am a full-time professional folk singer, storyteller, multi-instrumentalist, songwriter, and sea-chanteyman. 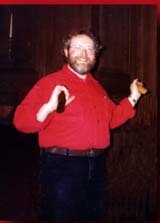 In 1991 I was designated Connecticut's first "Official State Troubadour" via legislation passed by our General Assembly, and signed by then Governor Lowell P. Weicker, Jr. My dad had played bones in minstrel shows, music halls, and as part of some small-time accapella groups as a young man in 1930's Connecticut. As a small boy at his knee, I remember him taking spoons out of the dish-drainer, and playing them as bones to polka tunes that pulsed out of our kitchen radio every Sunday morning. I do a lot of arts-in-education programs in schools, libraries, teacher-training, etc. along the Eastern Seaboard, from Maine to Florida. I've taught thousands of people how to play the spoons, and inspired a few into trying the bones. Using my assortment of bones made of varying materials illustrates the different timbres that are possible. I really enjoy being able to spark students' recognition and appreciation of distinctions in sound potential. In performance, I use bones for Irish music, old-timey Americana, and sea chanteys - and wherever they seem to fit the mood. I became interested in the bones seeing others playing them at renaissance festivals and session jams in Colorado. Rowan Corbett used to perform with a few members of the group I currently play with, and my first pair of bones, which were made by Rowan, were gifted to me from my bandmates when I complained of not having enough to do, because as a singer I was the only one who didn't play an instrument on stage. 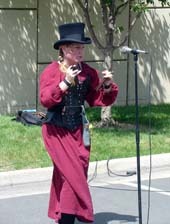 I was busking at the Colorado faire, when I saw Vash's group, The Bringers, perform. Vash's playing blew me away, but I was too shy to ask him for lessons, so I got the beginners lesson from Steve and Annie Mariner and drove everyone around me crazy for a few days. I went to work during the week and brought Rowan's bones with me. I finally "got it" clacking away in the alley behind my work, and the following year I brought them on stage with me. I play mainly Irish folk. "...Bones...It's harder than it appears!" One evening whilst at a gig in a pub in Deptford I saw a great bones player called Esther in a band by the name of 'The Seven Kevins'. She played two-handed. The bones, probably the most humble and most ancient of instruments, are very special to me. My favourite set I have had since I started playing. I would be bereft if they were ever lost. They were cut from a cow's ribs which were given to me by a butcher in Honor Oak, Lewisham. Since the early 1950's Norm Conrad has had an intense interest in minstrel shows. He learned routines while in high school, first with tambourine and then with the bones. Norm has a one man show known as Norm Conrad's Mini Minstrel. His show brings back those minstrel days by playing the bones and tambourine in addition to pantomiming stars from the past as Mr. Bones and Mr. Tambo. I am a two handed bones player living in West Cork Ireland. More info and photos can be found on my web site www.robcoppard.com click on the Rob the Bones page. Dan has thus far been the official sound man for all of our Bones Festivals. He can play the bones however, he is an excellent guitarist. He has written several melodies, including a song titled "Bonesgrass" that go real well with the bones. "I learned to play bones at age 9, I found that they can be used as an accompaniment or a lead instrument." "On my way to a family vacation, My father, a bone player, informed me that he left his bones at home and asked me to bring them too him. Well, misfortune happened and my car was broken into on the way and believe it or not the bones, among other things were stolen. To make a long story short, I had some real explaining to do the the police officer after I reported "I was delivering my dad's bones and they were stolen from the car". My favorite tip for playing is: the harder the bone, the better the sound." Martha is the creator of this web page. "I can't remember not knowing about the bones and trying to play them, finally I got my own pair and taught myself how to play (one hand at a time) while driving in the car. Now I just love them, and don't leave home without them." Tom came to Bone Playing already knowing how to play drums for rock and roll music. He has a very unique approach to Bone Playing, he sort of plays them like he plays the drums. He is definitely in control of the clicks (no slop here!) and he gave us a good taste of what a drummer can do at Bones Fest II. John has been playing the bones for 56 years. He learned from a friend of family, the late George Brooks, when John was 15 years old. I am Edgar E. DeLong, Lieutenant Commander, U.S. Navy Retired. I learned to play the bones at age 10 from my grandfather who was a minstrel performer and circus clown. Over the years I kept active at it as a hobby. Since retirment from the navy in 1969, I became an active participant in Lions Clubs International's music scholarship program in Virginia honoring black music composer James Bland who wrote Carry Me back to Ole Virginny, Oh Dem Golden Slippers and many other (about 700) other songs. I got interested in him and wrote a musical show titled "Golden Slippers" which required use of the bones and costumes of the Philadelphia Mummers dancing to that tune. It was produced by University of Maryland Eastern Shore in Princess Anne MD in April 2006. I have been playing the bones since 1987 when i was reunited with them through a book I bought. Originally taught by an old paper route customer in 1976, George Hayes of Plainville, MA, he was 96 and played every day to polkas and minstrel music. after a few years practice I quickly converted my style to a hard fast paced rock,punk and celtic jigs and reels. I met up with master hammer dulcimer builder/player Glen Morgan of CA. http://fishbitemusic.com/ He enjoyed the fact I could keep up with his fast tempo, execution style playing at the ren fair in Sonoma County CA. I also accompanied several bands that played celtic rock and even jazz music was not out of reach! I'm presantly slowed down the pace to Herb Alpert and the T Brass Band and salsa music. Andrew deValpine of Dillingham, AK. When I was a college student in San Jose, Costa Rica, I met a wooden bowl making expatriate named Barry Biesanz who loved cowboy and jug band music and who had been making wooden bones. He gave me a set of two pairs, made of some local wood, and he showed me how to hold them. I held on to those bones for another three years before I tried learning to play them. The breakthrough was on a two-hour drive from where I was living in northeastern Kansas to my parents in Kansas City; I just decided to start trying while listening to the radio, and at the end of the trip I was in time and making musical sense. After learning that trick I practiced whenever I drove anywhere. Sometime around then I saw an alternate way of holding the bones and started practicing that method with my left hand. I've been playing ever since to any style I can, but mostly to Irish and old-time music. Dogs chewed the old wooden bones -- I still have a portion of two of them -- and now I use commercially made bone bones picked up from Lark in the Morning. For a number of years I had some home-made cow-rib bones but they, too, fell prey to the jaws of mutts. One more thing, a comment a friend made once about the bones I find to be true every time I pull them out. "People can be playing the most unusual, exotic and sophisticated instruments, and playing them well, but as soon as you start playing the bones observers forget all about those other instruments. I played for five years percussion with Riverdance the Show all over the globe, and now I am living in Israel, playing bones, spoons, bodhran and other percussion, with Evergreen and other bands. I am now 73 years old and I have been playing the bones since I was 10. I have played in Pubs and Clubs all over the country, always for pleasure not professionally although I have won a few competitions in my time. 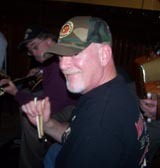 I play along to all sorts of music reggae is my favorite but Irish folk, jazz are good, anything with a good beat to it. In the 1970's John's band-mate, banjoist Bill Kavanek invited him to attend a Civil War Reenactment on the condition that he bring along a guitar. After several years of campfire picking with the 22nd Virginia Volunteers they noted that the music did not meet the same authenticity standards as was set by the military activities. Over time John and Bill transformed from infantrymen into the recreated "Ethiopian Serenaders," an actual popular ensemble of the 1840's. John "Professor Ole Bull" and "Old Cornmeal" Kavanek were joined by "Signiori Boni" (Bob Cassidy) and "Paganiger" (Keith Walters). To insure authenticity John reseached and constructed reproduction banjos, tambourines, bones and also he restored antique parlor guitars. John occasionally performs with The Second South Carolina String Band and can be heard on their latest CD release "In High Cotton." Though Chris and I have been playing traditional music for quite some time it was only a few years ago when we got into bones playing. We moved to Hannibal,MO where we really got into mid-1800s music and found bones to be a real treat for people. We meet the folks getting off of the riverboats in Hannibal playing our music. Life is good here on the river! I would like to get involved in your group, as I have been playing two handed Bones for Sixty years now and been a rock drummer for fifty. I most likely have something to offer despite my age. I am full of 'pep -and vinager'. I play a lot in the area and teach as well as teach the production of Bones... not wood but bones. I play every kind of music , from celtic, french canadian jigs to rock to rap and disco. Yea--- RAP... try that sometime, the kids love it. Go to www.leventdescantons.com to learn about my group and the music we play. 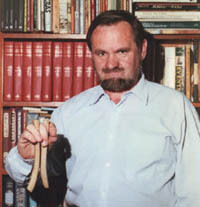 Al Grant of Toronto, ON, Canada. This is to introduce you to the Grant family of Toronto, Ontario Canada. My father,-Jack, who passed away in 1999 at the young age of 91 taught me to play the bones at age 8—which I have been playing ever since. Played many times in shows, fairs etc. Dad had been playing all his life and I still have the bones he used. My daughter Alana took up the bones playing while in college—so now she continues the history—(we now need to teach her kids—see attached picture.) 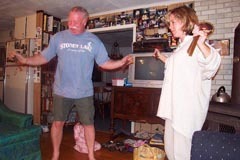 I will try and find a picture of my father Jack, myself and Alana all playing in the same picture and forward. I have never heard anyone else play, other than the Grant family members and would look forward to becoming more involved in the 'bones' community. We are located in Toronto Canada but grew up in Hastings County—a rural, farm area. The attached picture shows my daughter Alana ( expecting her third baby Gracie) and myself at our cabin up north—having fun! Mel Harvey of Findlay, OH. My name is Mel Harvey, Findlay Ohio. I Learned to Play them in 1948 I am now 71. Some of my favorite tunes to play to are Down Yonder By Del Wood, Sweet Georgia Brown, Alabama Jubilee, Golden Slippers Etc. I have taught my son Ron and my brother Norman how to play the bones. I do not nor have I tried to play professionally although I have played with quite a few bands. Polka Bands ,Bluegrass bands., Cake walking Jazz bands , country etc. I just enjoy playing the bones. I would like to meet other bone players. My first few sets of bones came from cows ribs that we butchered on the farm, then I bought some ebonized wood bones, Then I found a set of four rosewood bones that I really liked, however they were burned up. I had a set of pure ivory bones that were too heavy I gave them away I have had several sets of plastic bones, some bones I made out of ebony. I have just ordered a set of four made from cherry. the hardest thing I find is finding tapes or Cds of the tunes that I like to play best. Poul Høxbro of Copenhagen, Denmark. Poul Høxbro has both a classical diploma and soloist’s diploma from the Carl Nielsen Academy of Music, and a background in rock and folk music. 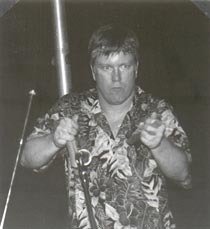 His unique work on medieval pipe and tabor has brought him international acclaim, and resulted in multiple prizes, including the Danish Radio Symphony Orchestra’s prize of honour, the Emil Holms Scholarship. His remarkable musicianship and his virtuosity on folk and classical pipes and historical percussion instruments, means that he is highly respected and sought after as a collaborator across multiple musical genres and in many countries. Poul Høxbro is well known for incorporating narration into his concerts and he has for many years performed with story telling in both Danish, English, German and Swedish. He can also be experienced as an instructor of dancing with medieval roots. I have played the bones for about 47 years. My grandfather taught me when I was 7 years old. He made them from the ribs of a cow and we also carved them out of cherry wood and hardwoods I thought I was the only one left to know about rhythm bones. It amazes me to think I have been playing the bones(since I was twelve, now seventy six) I did not know that your group of Bone players existed. I have read all the pages on your web site, and I really find it very exiting.The standard of bone playing is very high, I am just lost for words when I read about the Bones Fests, The Bones: Ancient To Modern by Sue, E Barber and the interest in trying to teach playing the bones. I only know one other Bone player he is a school pal who emigrated to Canada many years ago. We are still good friends, and we often talk about the bones. I am a lifelong folkie, guitarist, banjo player, and sometime songwriter. I first heard the bones played by Faith Petric of San Francisco. Twenty five years later a local band, The Free Staters, lost their bones player and advertised for a replacement. Well, I never learned the bones from Faith, but had been playing spoons for many years and weaseled my way into the band on my spoon playing, with promises of learning the bones. Jonathon Goering, our banjo player, taught me the basics, and I got some pointers from Greg Burrows when I was in New York in July of '05. I play a very heavy pair of black angus bones (a gift from "Mr. Bones" Ownbey) in the left hand and lighter, thinner pair of buffalo bones (that I make) in the right. We play music from territorial Kansas, 1840's and 50's, mostly a mix of minstrel tunes, Irish ballads, and American folk songs. Long live the Rhythm Bones Society. 70 year old Hoosier born Glen Delmont Johnson, a.k.a. "Hoss", has been rattlin' the Bones since the age of 5. He claims that he ended up with the Bones, because his dad got the Banjo, one brother got the Mandolin, the other brother got the Harmonica, and there were'nt anymore instruments to go around. Hoss's current set of Bones are made from the remains of a well enjoyed meal of Barbecued Beef Ribs. He cured them in the sun, and polished them with a piece of glass, and has been playing this set for more than 40 years. Hoss now hails from Canon City, Colorado, where he and his wife Barbara make music with their band, "The Canon Creakers". Celtic Kilroy plays a variety of instruments such as guitar, banjo, harmonica, Irish penny whistle, Irish drum (bordhan) and rhythm bones. He purchased and was taught to play the bones about 25 years ago at the Wheatland Music Festival by Percy Danforth. For the last sixteen years as a solo musician, he has performed at many type of venues such as; private parties, assistant living homes and various pub gigs. He enjoys wowing his audience by playing the bones, shaker and harmonica at the same to either a classic or an old time favorite tune. He is now in the process of working on a bordhan and bones tune were he alternates playing each percussion instrument during one song utilizing the bones for the drum stick. He also laid down tracks with some of his original pieces for video productions. Celtic Kilroy's mother maiden name was Rita Jenette Cowett. She was raised in a small town near Boston Massachusetts called Weymouth. Although Celtic Kilroy never met his long lost cousins in Greesboro, NC, could the bones simple be in their blood? I got my first set of bones from Sandor Slomovits in Ann Arbor while taking a creative musicianship class at the University of Michigan. I then fell in to a group that played authentic Moroccan music, and the bones were made honorary Moroccans. I had the privilege of playing with Percy Danforth once, who gave me a very high praise indeed, "You've been playing the bones!" Since then I have been sitting in with Contra Dance bands (reels) from Colorado to the Capitol Beltway. I play Danforth Bones made by Ray Schairer – Pine in my right hand and either Cherry or Oak in my left hand. Playing bones is one of the joys of my life. My first set were made by my teacher Richard Clifford, who in his own right, is an amazing bone player as well as crafter. I play weekly in Hartford at a Irish session hosted by Donegal fiddler P V O'Donnell for the last three years. I play one-handed and have various types of bones of various materials (shin, rib, ebony, wood). I also was on a CD with Tom Callinan titled "Festival' on the Erie" for our two week concert series last June. I also like the mandolin as well as wooden spoons. The first bones playing I ever heard was in the Eighties on "Chieftains 7". In 1992, I joined a traditional Irish group and learned how to play the bones. I started with a pair of rib bones from the butcher, presently I play two pairs of Nick Driver whalebone bones (to traditional Irish music). My most important influence is the playing of Mel Mercier. I started playing the bones in the mid 1990s after hearing them on an album by Spider John Koerner. I currently play with the Tanglers and Saltpeter in the San Francisco bay area. I like playing along with many styles of music, traditional American, Irish, European, Middle-Eastern, African, Funk, Jazz...even Beatles singalongs around the campfire. I also play a little concertina and tin whistle. I make my own bones, mostly out of exotic hardwoods, in several shapes and sizes, including some with leather striking areas or grips. I often use a thick, ungainly pair of bone bones (from the butcher) in my left hand, because I like the sound. You can see and hear more at my website, Bones.JeffLeff.com, including a brief introductory lesson with animations. My name is Tom Lockhart and I come from Bannockburn in Scotland myself and my good friend Paw Broon both mastered the Bones after being blown away by a two handed player we had the opportunity to hear down at a folk festival in Edale England. They took a bit of learning but we mastered the technique and are in demand at all sorts of folk music events especially Paw who is like a Chinook Helicopter in full flight, they sound beautiful miked up. The bones I own which are about seventy years old and made of ebony they have a deep stinging rattle to them, they used to belong to a professional entertainer his daughter who gave me them told me he appeared playing them on very early BBC Radio programmes. The best sound I ever made from bones was from real whale bones, very heavy and an indescribable sound they were also very old, I wrote to Tromso in Norway to try and obtain a piece of whale bone to manufacture my own as they are still allowed to take whales there for scientific purposes but to no avail. I enjoyed visiting your web site, I am presently on an oil rig in the middle of the North Sea good luck to the world's fellow bones players, it is amazing the enjoyment the 'Worlds Smallest Percussion Instrument' can bring to so many people with a lot of them to asking, what is that you are playing? just like I did as they have never 'clapped' eyes on them before. I once played them in Mexico with a 'Macharachi Band' they loved them and asked what they were I told them "Scottish Castanets". I play wooden rhythem bones (2 hands) with a tunable style. In 2001 I met a fantastic bones player at a festival in Skagen, Denmark. I was working backstage serving beer, when I saw a man sitting by him self, shaking his hand with some sticks in it. I was speechless!!! It was Yirdy Machar. My English was realy bad and I had to gather all my courage, to ask him what he was doing and then he replyed in Danish! "Sit down and I'll show you," he said and I have been playing since. I started on the bones when I saw a fellow play them at a contest. that was 40 years ago! I also play the musical saw. I have taught both, indivually and in workshops. I occasionally play with a small local band, but mostly I’m a parking lot picker. I'm a Chiropractor in Newaygo, Michigan. I learned to play the bones from my father when I was very young. I eventually became a drummer, and do both now for fun. I do some civil war reenacting, so they both fit in. I have a set of bones (wooden, painted black) given to me by my late father. I also have a couple of purchased sets. I had to have a set of Percy Danforths. I make my own and enjoy trying different woods. I hope to start a 'bone' collection, but want to make my own. I have several friends on the look-out for moose. elk, cow, ect. ribs. I play with both hands and enjoy playing civil war era music. 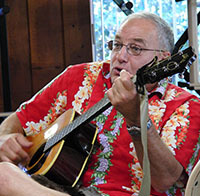 Bill Rexroad is a musician and storyteller who performs throughout the central United States. He has been a bones player for over fifteen years, and incorporates bones playing with his storytelling. Children in particular are delighted with his story about playing the bones, then seeing a demonstration of the art. Tom has musical roots in bluegrass. "My interest is 19th Century Minstrel Music particularly bones, banjo, & fiddle. I`m 67, born in Barbados West Indies (where I am also now living)..My Grandfather was a real expert bones player, and he taught me when I was about 14. I seldom play, as young people don't really know what its all about, and the chances to play in public are limited down here. I usually pull them out and play at family parties…My mom of 90, still plays the piano, and will play some old tap rhythms for me to play by.I learned to play with both hands, and use the same bones that my Grandfather used to play with. There are made of a dark wood, I believe from Africa. It is interesting to see that there is still some keen interest in this dying art…I believe I am the only living player in Barbados (population approx 300K) I hope to come to the annual Bones Fest of the Rhythm Bones Society, if not this year, then next year. Im sure I will learn some new techniques from the pros. Click HERE to see a video of me playing. 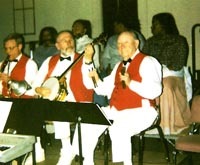 As a mid-19th century living historian with an interest in the Mexican War, California Gold Rush and American Civil War Ed, in 1999, started listening to the recorded music of bands such as the Amoskeag Players, 2nd South Carolina String Band and Bob Flesher aka Dr. Horsehair. He became enthralled with the sound of the bones and the banjo. The only music Ed plays is American Antebellum Pop music which is the music of the minstrel stage. He is in a band The Free and Accepted Minstrels of Old New Orleans. He plays the bones, banjo, jawbone, tambo and triangle. I have been playing bones for 65 years and first picked them up at the age of 10, I play both hands sometimes 4 in each hand. I grew up in Brockton, Mass. I currently live in Miami, Fla. I enjoy Dixieland, Irish music. My first set of bones were ebony wood. I also play orchestra drums. My grandchildren invite me to their schools to show their friends and to sing along with me as I play. The children are fascinated! I just turned 82 and am happy to show folks the bones and they enjoyu listening. My first set of bones were ebony wood. I played drums in several local groups for many, many years. I would love to hear form fellow bones players in the South Florida area. Vash has been playing bones since 1997 when he met (briefly) with Rowan Corbett of Tinsmith at the Kansas City Renaissance Festival. Vash was a bodhran player interested in the bones, and Rowan a bones player learning the bodhran. A quick lesson on how to hold the bones followed, and a few months of solo exploration later, Vash had his two handed style down. Bones and spoons have since become a mainstay of Vash's percussion arsenal since then. 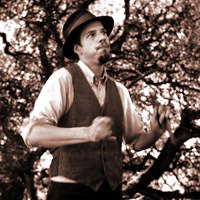 Vash has played bones along with Celtic, Olde Tyme, Bluegrass, Spanish, Jugband, Jazz, and Rock music. He also plays them to accompany his singing, and as free form improvised percussion performances. Inspired by Artis the Spoonman, Vash has added spoons, knifes, forks, spatulas, pie servers, and tuning forks to his broad collection of bones, "woods" and one set of antique ivory plaques. Vash is and has been a member of several bands and ensembles over the years, performing a wide variety of music in venue ranging from concert halls to street corners, from renaissance festivals to classrooms. 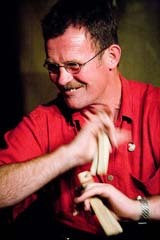 He is also an accomplished solo performer and music teacher, specializing in teaching bodhran, bones & spoons. His web site is http://www.bodhranai.jackalpress.com. 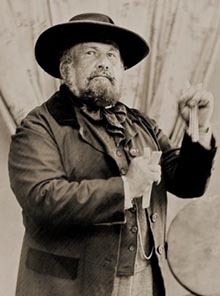 I became interested in playing the bones through a combination of living history and a love for 1850's and 1860's music. By following the advice of a friend who plays the banjo in the original method, I quickly took to the bones. Within several weeks I was playing them with ease. I am now particularly interested in playing civil war era minstrel music. Currently I am the bones player for the Allendale Melodeons, a recreated civil war minstrel group. All of the boys say the the bones were the finishing touch for that periods sound. I favor playing an original set of rosewood bones and a pair of bone bones. I also have an original set of ebony bones that I call my "parlor bones" because of their quiet sound. Chicago's western 'burbs. Played since I was 6 or so (72 now) - Dad was a Mummer and did minstrel in the Philly area. Dixie Land, Stop & Go or most any place a beat is needed. Both hands, but still haven't learned to do beat on one & melody on the other. My fun has been piano bars from San Fran to Bangor and self taught routines using the knobs on the back of steering wheels (before they softened them up). A short story of how you got into playing Bones. What style of music you like to play the Bones with. Where you got your bones and what are they made of. (If you have one) a picture of yourself playing the Bones.